The 1911 Hoge Building represents the wealth and extravagance of America's early 20th-century financial elite. The building--named after John Hoge who personally financed the project--is considered to be the second true "skyscraper" in Seattle (the Alaska Building was the first). The design of the building displayed particular concern for seismic events, and the architects incorporated into their design the results of studies of structures in the 1906 San Francisco earthquake. Perhaps the most amazing feat of the entire project was that its innovative steel frame went up with such rapidity that all 18 stories were in place in only 30 days. The handsome Beaux-Arts design featured elaborate cartouches at the third floor, below which ran two stories of terra cotta ornament. Elegant tan brick covers the rest of its exterior and a cornice richly decorated with lion heads tops the building. An interesting sidebar to the construction itself was the competition between Hoge and fellow financier L. C. Smith to own Seattle's tallest building. Smith was simultaneously erecting a tower he would also name after himself, and although the two friendly adversaries had agreed that 14 floors would fulfill their business needs, the Smith Tower's original plan called for 18 stories. 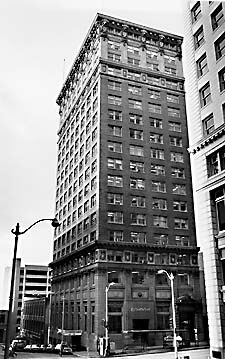 The Hoge Building also had 18 stories, but its elevated site and the extra height of each floor allowed it to temporarily become Seattle's tallest building. Smith, however, permanently regained the title by adding a 24-story tower to his building, a physical feature the Hoge building could not structurally support. Today, the Hoge Building stands as a reminder of the incredible wealth and differing tastes of an earlier generation of businessmen. The Hoge Building is located at 705 Second Avenue, just north of the Pioneer Square-Skid Road Historic District. The building is open to the public during regular business hours.